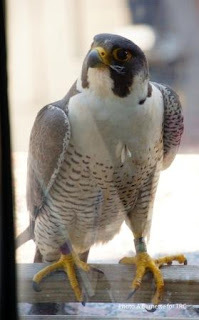 Staff of The Raptor Center and the Midwest Peregrine Society banded four healthy peregrine chicks at the Colonnade building. 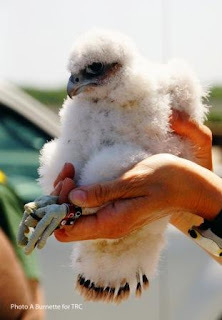 There are two different bands placed on the birds’ legs; one is a federal band with nine digits, and the other is a color or project band; in this case, they are black and red. 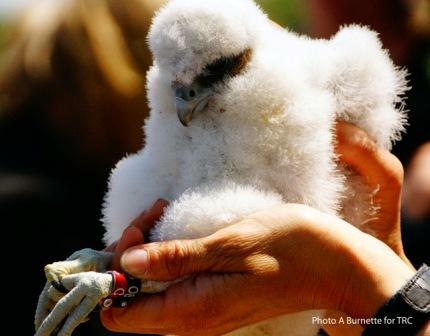 The bands will identify the birds throughout their lives as they hopefully fledge and find nesting territories. We use this information to track site preferences, population dynamics such as survival, longevity and dispersal, heredity, and other aspects of species’ biology. Blood samples were taken for later study, and the chicks were quickly taken back to their nest box. The Colonnade site is one of the oldest and most productive in the Twin Cities area; since 1991 and counting this year, there have been 74 chicks produced at this site. 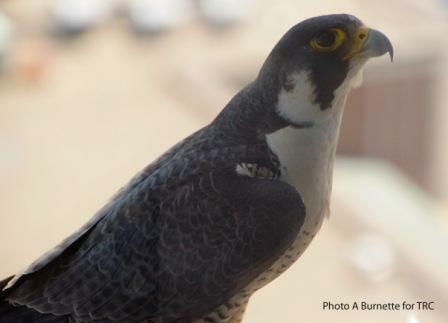 The Midwest Peregrine Society, headquartered at The Raptor Center and headed by TRC’s co-founded and former executive director Patrick Redig, has a database that contains information about sites and birds for the project. This includes 13 Midwestern states and 2 Canadian provinces. 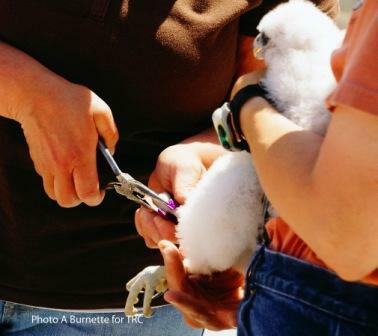 At the end of the busy peregrine banding season, all of the information will be put into the database, which is available to the public.